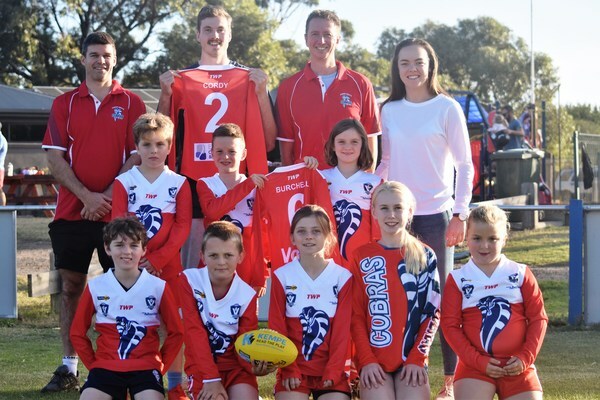 Local Western Bulldogs AFL premiership player Zaine Cordy and AFLW newcomer Hannah Burchell unveiled their new Ocean Grove Cobras guernseys at a special jumper presentation on 4 April. 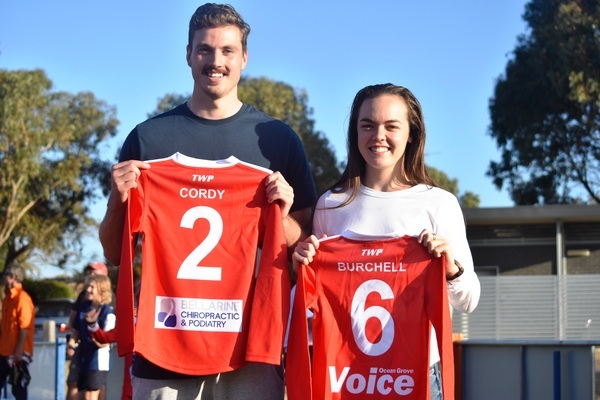 Cordy and Burchell who grew up in Ocean Grove and began their junior football at Ocean Grove Collendina Cobras Junior Football Club, were honoured with guernseys in their name by the junior club. Ocean Grove Cobras’ committee members attended presentation alongside enthused junior Cobra youngsters which received their new playing strips for 2019 season. Cordy who celebrated his 50th AFL senior game for Western Bulldogs against Hawthorn on 31 March, said it was nice to return to his junior footy home for the honour which he shared with older brother Ayce. “I found out a couple months ago, it is a big honour actually and I played my junior footy here and had some very good times here at Collendina (Cobras Junior) Football Club, which is now Ocean Grove Cobras,” Cordy told the Voice. “I loved it and I know Ayce loved it too – and Reece our oldest brother played down here as well. Cordy, 22, a member of the 2016 Bulldogs AFL flag, is one of five Cobra juniors to be selected in the AFL national draft. Others include Ayce Cordy, who played 27 games with the Western Bulldogs, Guy O’Keefe, an ex-Western Bulldogs listed player, Ocean Grove Football Club senior playing coach Jordan Jones, who played two games with West Coast, and Sam Walsh who was taken at No 1 last year by Carlton. Jordan Jones attended an earlier jumper ceremony and presented guernseys to Cobra juniors. All Under 10s junior Cobras teams were named after AFL draftees Cordy, Jones and O’Keefe. MEANTIME Geelong AFLW player Hannah Burchell was delighted with her name being inked on the first Cobras junior girls’ jumper which takes effect next season in 2020. “It is pretty surreal being back here, some pretty good memories on this ground and even better to have a jumper named after you – so that is special,” Burchell told the Voice. Burchell made her Geelong AFLW debut against Greater Western Sydney in Canberra on 15 March. The Burchell girls’ team is sponsored by the Ocean Grove Voice.